We all have our favourite wardrobe staples that are our go to key pieces day in & day out. Those perfect items of clothes that we can slip on & instantly feel comfortable in – they never let us down! But more often than not, I’m always hearing someone talk about how uncomfortable they feel when a new situation arises & you’re forced to move away from your comfort zone because your regular trusty garms just won’t make the cut? 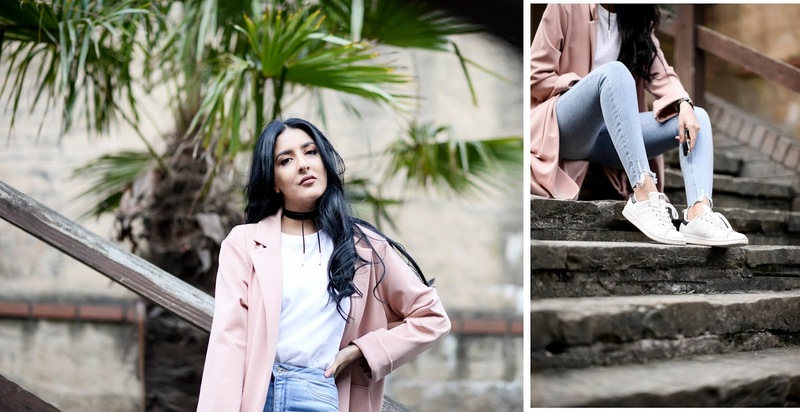 I’ve teamed up with New Look to create two very different looks around one comfy pair of distressed denim jeans (a women’s best friend). If relaxed, laid back looks are your thing, then stepping out the house each day in an outfit like this on above will be pretty relatable. I don’t think a day goes by when I’m not longing to be in my trainers and high waisted jeans if I’m not already in them. I always like to leave the house looking like I’ve made a little effort, even in a casual day to day outfit like this (is this just a blogger thing, let me know?). The ruffles on this cute white basic tee definitely add a touch of Spring to the outfit & you can never go wrong with a basic white tee.But what happens when your basic tee & denim combo isn’t enough? The best styling tip I could give to someone would be to take an item of clothing you feel the most comfortable in & to play around with the other elements in the outfit to change up the feel of the outfit. For a touch of chic I took my own advice and ran with it! It’s hard to replace jeans because lets face it, they’re the sh*t and they’re even harder to replace if its the one type of clothing that you feel the most comfortable in – so instead I switched my kicks for some sassy pink stilettos and added a statement jacket along with my trusty ol’ fedora & I instantly felt like a glam lil chica. The casual base of my outfit remained the same, making this the the perfect day to night outfit. Fitting for those after work drinks that will be a regular thing now that the sun is making an appearance again! 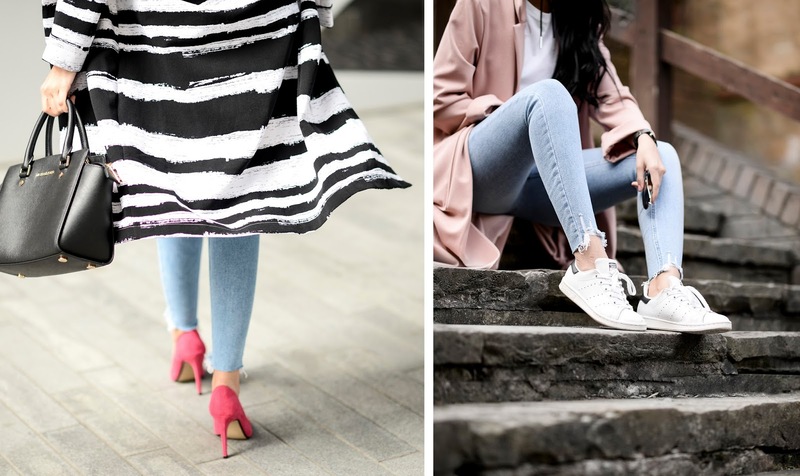 New Look have some amazing distressed denim jeans in rn, so I’ve complied just a few of my faves for you! Just click on your fave pair & let the internet do the rest!